The What: Kaltura announced the launch of its next generation personal video capture product, Kaltura Personal Capture. The What Else: Kaltura Personal Capture offers users the ability to capture both screen and camera in just one click. It also includes a new automatic slide detection feature—if a user has a PowerPoint presentation in presenter mode when recording the screen, Kaltura Personal Capture automatically detects and captures it, making videos more searchable and discoverable. Kaltura also automatically captures metadata from slides and audio, which are made immediately searchable as well. Kaltura Personal Capture encourages more content creation and makes it easier than ever before. It seamlessly uploads new videos into the user’s My Media folder and videos are made available in an organization’s Learning and Content Management Systems as well as the Kaltura MediaSpace video portal, making it easy for employees, students, faculty, and other users to create professional video with multiple feeds, including slides. Anyone in the organization can make engaging videos, without specialized equipment, within minutes. 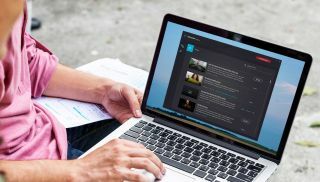 The Bottom Line: The design of this capture solution makes it easier than ever before to create videos from the desktop. The new product lays the groundwork for even more ambitious and powerful capture features in the future.